09:30hrs: Depart from our Nairobi office for a journey south along the floor of the Great Rift Valley. Lunch at Narok and then climb the Western Wall entering Hemingway Country Plains "Serengeti Plains". Arriving late afternoon in the Masai Mara Game Reserve. Check in at the camp or lodge. Early evening game drive returning to the camp/lodge for dinner and overnight. A full day spent game viewing across the rich, tree studded grassland and rolling hills. The famous Mara is renowned for its great herd of plains game, black maned lion, leopard and cheetah. It also has numerous elephants and virtually every type of wildlife to be found in Kenya. All meals and overnight at the campsite/lodge. 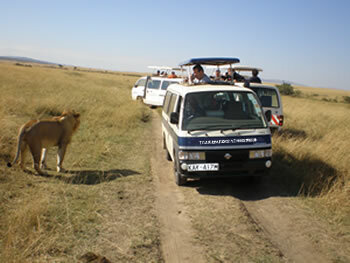 After breakfast, proceed for a game drive then depart for Nairobi with lunch en-route, arriving in the late afternoon.